The California Two-Spot Octopus offers a very distinct appearance. It is also known by the name Bimac Octopus. They have blue spots around the eyes that can vary as far as the shade of it. The body spans about 7 inches in regards to the mantle. The arms though are considerably longer with a reach of about 25 inches. The coloring for the overall body though can be very different, it all depends on where they happen to be in their environment. They are commonly a grayish coloring with yellow spots on them. They do have the ability to change colors though through the control of their pigments. With a name like this, there is no guess work involved with where they happen to be located. They do very well in the warm waters, from 65 to 72 degrees Fahrenheit. While that is where most of them live though there are some other locations they have for habitat as well. They include the waters of Mexico, Africa, and areas of Japan. They tend to live about 65 feet below the surface of the water. Generally Octopus live much deeper so this gives people the opportunity to see them frequently compared to other species. Therefore they are in the shallow areas so they can reach the sandy bottoms of the water. They like to hide in rocks and crevices found there. When it comes to Octopus this is believed to be one of the friendliest species. They do spend most of their time isolated. 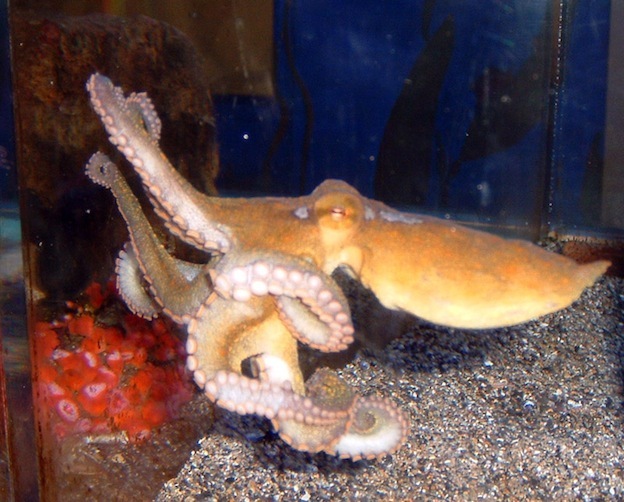 However, if you are going to have a type of Octopus as a pet then this would be the one to have. They are very intelligent animals though so if you have one as a pet you need to be prepared. They are known to find ways to take the lids off of aquariums and escape. They don’t seem to go into hiding as much as other species of Octopus in the wild. They seem to be more confident in their ability to blend in. They are tolerant of other types of Octopus around them too as long as they aren’t directly competing for food. The California Two- Spot Octopus has plenty of opportunity for feeding where they reside. A steady stream of mollusks and crustaceans are readily available. They are easily able to remove the shells from most of their prey. Those that they can’t are removed through the toxins in their saliva. These Octopus will also eat small fish when they have the opportunity. Mating takes place at a young age for these Octopus as they have a life span of no more than two years. The males will avoid females until they are ready for mating, and then aggressively pursue them. It is common for them to mate with as many females as they can. After that period of time is over though the functions of the body simply start shutting down. The males won’t live more than a few weeks after mating. The females have the same destiny, but first they have to fertilize their eggs with the sperm that the male has deposited into their body cavity. They will fertilize the thousands of eggs one by one. Then they tuck them under their arms in an effort to protect them until they are ready to hatch. Exhausted and without food for months the female will die as they start to hatch. Many people have reported interacting with this particular species of Octopus due to the shallow waters where they live. Generally the Octopus will swim away in a hurry. Sometimes it will release ink too in order to help them get away without being followed. They aren’t dangerous to humans so there is nothing to worry about if you are in the water with them.